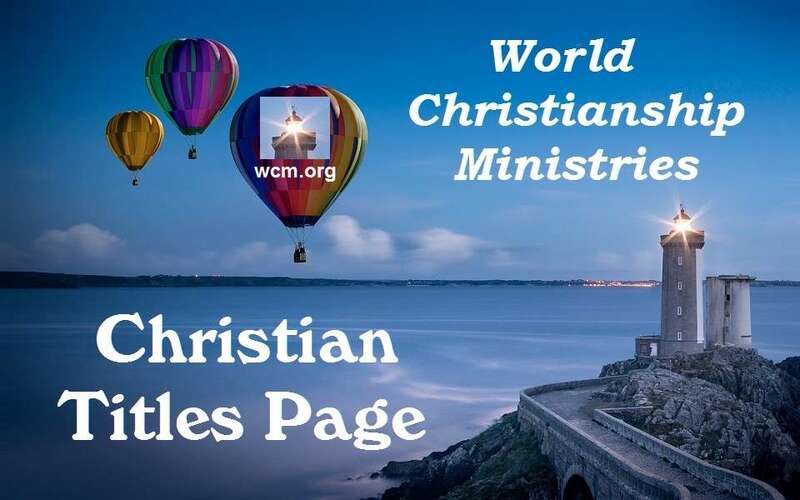 This page will help you to decide on the title you wish to have when you are ordained by World Christianship Ministries. These two Christian titles are what we refer to as our general titles. This means that they can apply to almost all types of Christian work, from pastoring a church to having a wedding ministry or being a marriage officiant, Christian relief work, hospital and convalescent home work, just about any type of Christian work you can think of. For this reason the Minister and Reverend titles are the most popular. The Pastor title is also a rather general title but leans a little more towards actually having a church. This does not mean you must have a formal church building before using the title. It can mean that you are holding services in your home (if zoning regulations in your town or city permit it), or that you plan on having a church in the future. Also, as with the Reverend and Minister titles, you can use the Pastor title as a general title also. If you are comfortable with the Pastor title then you should certainly use it. The title of Assistant Pastor is for someone under the authority of another Pastor or Minister. The Evangelist title is more specific. If you choose this title you feel more of a need to be on the move, maybe from church to church, ministry to ministry, wherever your Christian talents are welcome. You may also feel a need to participate in revival services and such. The Officiant Title means a person who conducts religious services. If issued by World Christianship Ministries it means Christian services. This title is becoming very popular for people who are specializing mostly in the performance of wedding ceremonies. The Chaplain generally likes working in some type of institutional environment. You might feel comfortable with veterans organizations, hospitals, nursing or convalescent homes (although Reverend, Minister and Pastor are also fine there), penal facilities (Note: once ordained you would need to establish your own church or ministry name in a way the facility accepts and enter the facility in your church or ministry name not WCM's), rescue missions and such. The titles Apostle or Prophet generally are chosen by an individual that wishes a more direct connection to the original Apostles and Prophets in the Bible. These titles inspire confidence and generally are used by one who is in some type of authority in the church or ministry. As with the Evangelist, the Apostle or Prophet may also like moving around more from church to church or ministry to ministry, and possibly might like to work on the international level. The Missionary is also one who likes to move around, inside and outside the country, and to areas of the world that may not have heard much about the saving Grace of Jesus. This individual might also be found in depressed areas of the city and countryside in his or her own country where poverty, and hopelessness need to be touched by God's hand. Generally a person who chooses the Elder or Deacon title feels more comfortable working under another minister. However, the Elder or Deacon may be ordained also in order to carry out the full range of ministerial duties. The title Preacher is a throwback to the 1800's and early to mid 1900's. This title is more likely to be used in the country, hills or mountains in smaller, more rural, communities. The title of Parson is similar to that of Preacher. The title Circuit Preacher is a person, like the evangelist, who likes being on the move. The Bishop title is somewhat misunderstood. Generally the person who picks this title, when being ordained, feels that they will be bringing other people into their church or ministry and wish this title in order to show their leadership position. The title music minister speaks for itself. This is a musical person who spreads the Gospel by their musical talents. If this is your main endeavor then this is a good title for you. This title is fairly new and gaining popularity. It is mainly used by people who are doing wedding ceremonies only. These titles are more for the Catholic faith, or similar orders, and we do not recommend them for the individuals we ordain as independent Christian clergy.